London is a pretty great place to be if you love books. 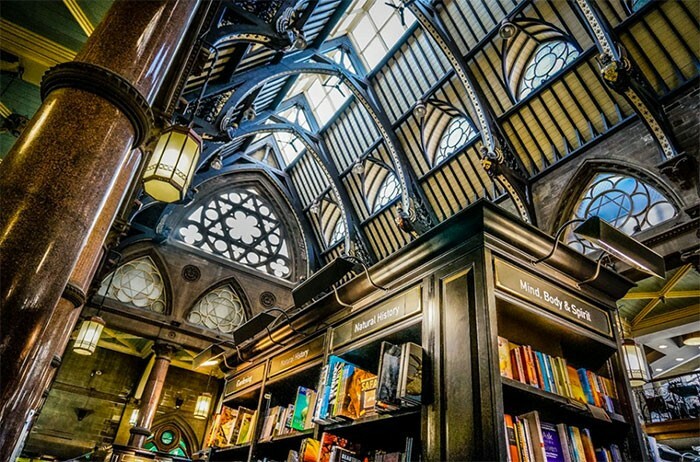 Apart from the fact that the UK is home to the most magnificent bookstore, Waterstones, there are a bunch of other bookstores that you absolutely have to visit if you’re like me and from somewhere where bookstores are a bit . . . you know. For those of you that are new here, I live in Australia and recently did the exciting thing of sitting on a plane for a devastatingly long time to visit the land of tea. Apart from being just generally mind-boggling, London convinced me that being a book addict I’d get along quite well with it. Obviously, I wasn’t able to do the entire of London. I’m afraid I wasn’t based in London and spent only a few days there traipsing around and poking my nose into corners to see what was there. But I hope that my list here today can perhaps provide some additions to that list you have of Bookstores to Visit When Abroad (don’t deny it). Nonetheless, I shall include also a couple of other bookish places to go that are not in London. For the sake of those of you completely unfamiliar with the geography of London, here is a little map so you can follow along where I’m talking about if it pleases you. I’ve starred the some of the main places I mention. Well, we have to start with this one. Waterstones will forever be my favourite bookstore in the whole wide world. Apart from the fact that I love how their books smell, the selection of books that they have on offers is amazing and convinces me without fail every time to buy something. Waterstones is everywhere. 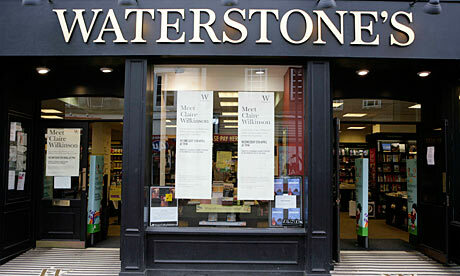 If there is civilisation, there is Waterstones. It’s a beautiful shop with a beautiful name and even has a cafe (well, a lot of them do). They’re a standard retail bookstore so their prices are your standard UK pricing (so, somewhere around £8/€10 – roughly, I’m probably wrong there but shush, feel free to correct me ye British readers). They also have a rewards system which I muchly approve of. What I find particularly mind-blowing about this store is it’s range and availability of books. 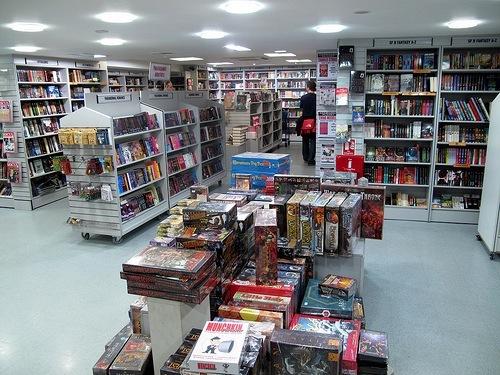 In Australia, our main retailer is called Dymocks and if you want something that is not current/popular/JK Rowling/George RR Martin then good luck to you sir! But in Waterstones? Ohh, Waterstones has the lot. There was only one book that I could not get my hands on for love nor money, and that was (surprisingly) The Phantom of the Opera. But most times I walk in, look at the shelves, and go OH WOW that’s a book that’s been on my Wishlist for years! I’m sure there are several wow-worthy outlets, but the one near Piccadilly Circus literally swept me off my feet. It is six storeys high. Yes, you read that correctly. SIX floors of endless books all categorised into nice little sections. 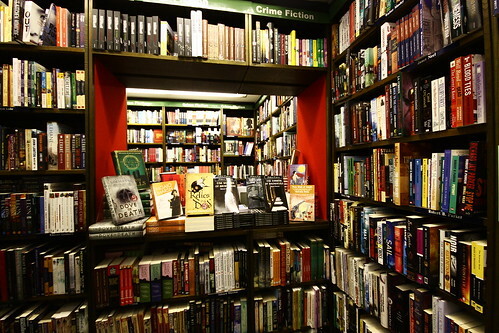 If you don’t believe that a bookstore can make you drool, then I challenge you to not drool in this one. They even have a fancy staircase and lifts (I recommend taking the stairs, they were much more fun than the lift). I wasn’t convinced at first about Foyles. You see, I had yet to come across an outlet that blew my socks off. It seemed, to me, to just be another bookstore providing you with your bog-standard books (but still with greater variety than Dymocks, rest assured). Foyles has a lovely modern feel to it. 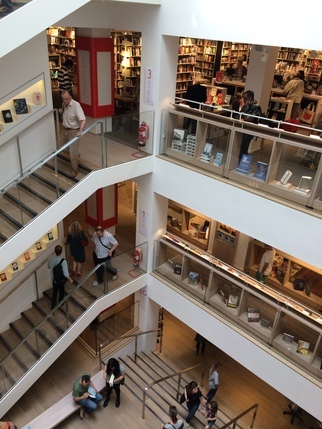 Whilst Waterstones boast a nice old-school bookstore, try-and-leave-without-spending-your-money feel to it, Foyles likes to show off its supreme cleanliness and crispness of displays (okay maybe I’m getting carried away, but just go with it). They have a lovely selection of books too BUT they have something that Waterstones doesn’t, and it involves Foreign Languages. I now take you to roughly in between Leicester (pronounced: less-ter, NOT lie-ses-ter, sheesh) and Tottenham Court Road. Here lies another four storey behemoth (I could’ve sworn it was six storeys but apparently not) with an even more impressive staircase. You walk in and go woooww, drool a little, and then wander up the ever so inviting staircases and get sucked into the books. What won me over big time (apart from the delightful and numerous Harry Potter books peppering any available surface) was that if you read in another language, this is where you can get your books. As I entered the foreign language section there was the BEST display of the Harry Potter books in all different languages which I totally took a photo of. But along with the dictionaries and literature of the languages, there was a translated literature section. Which meant that as I wandered into the Italian section (they had all sorts, French and German and etc etc ETC) I could pick up A Game of Thrones, the entire Harry Potter set, and so much more. I was a very happy chappy. I went into exactly one Heffers store but I really liked it. The store that I went to was not in London but actually in Cambridge (although I’m sure there is one in London?). Anyway. Heffers sells your normal mainstream books which oodles of selection and a solid range of Funko Pops. They also sell t-shirts (well, I found a cool one anyway (and bought it)). In fact! What made this an awesome experience is the Heffers in Cambridge actually had a games section. As in board games. As in try to not spend all your money. Every edition of Monopoly and Top Trumps and so much more was all on display in this delightful down-stairs section right in the middle. This was wonderful because I feel like reading and board games definitely go together. I also just really liked the lay-out of this store. The adult fiction (etc) was at the front (as well as a wicked Harry Potter display for the then up-coming release of The Cursed Child) but as you made your way through you reached the children’s section. What I find lovely about this British bookstores that are bigger than my house is that all the children’s sections are actually sectioned off by ages. I’m not going to lie either, I spent a lot of time seriously considering buying a bunch of books from the 9-12 section (and I’m 20). Ooh, doesn’t this one sound great? This is an absolutely glorious store smack bang in London. Again, you’re looking at roughly between Leicester Square and Tottenham Court Road. The reason that I found and went to this one was because I literally did extensive research before my trip to find bookstores to visit in London (#Priorities). And this lived up to expectations. If you’re a Fantasy, Graphic Novel, or Sci-Fi lover like myself, then you HAVE TO GO HERE WHEN YOU’RE IN LONDON. Okay? This is a specialist store that is two (gigantic) floors of geekdom. The first floor is merchandise – Funko Pops anyone? And I nearly bought various Doctor Who paraphernalia here. 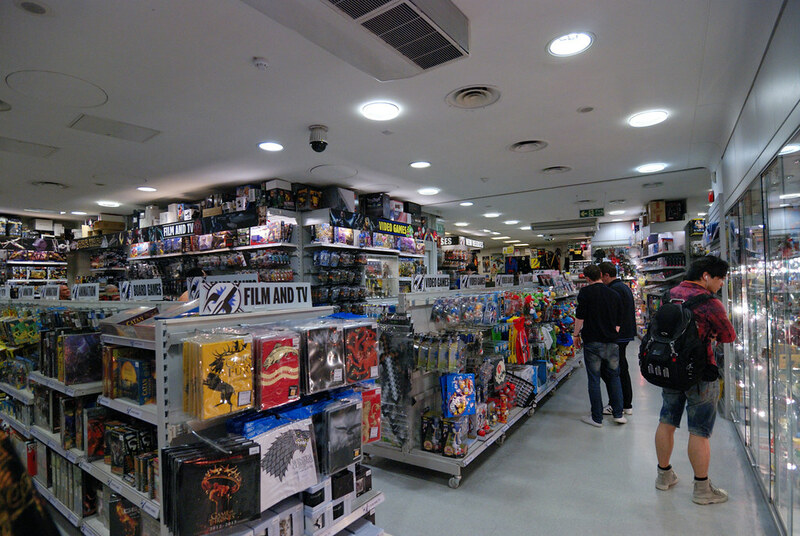 The store was also packed, every geek in London had decided to go into that store the same day as me, apparently. The second floor is where the party is at though. I say second floor but it’s the basement level (there’s a ground and then sub-1 floor, sort of thing). Half of this level is graphic novels and comics and the other is every imaginable Fantasy and Sci-Fi book. Like, all of them. The thing I love about specialist bookstores is that all these books you’re never EVER heard of are prancing around on the shelves begging to be taken. This bookstore was epic and as I said, an absolutely must for the geeky at heart. I take you not to a bookstore now, but to a second hand market where there are tables upon tables of books. If you walk over Westminster Bridge onto the Southbank then, if I remember rightly, you need to turn left and walk up the river that way. You should hit the markets eventually. In fact, you’ll pass a Foyles on your way to it, *waggles eyebrows*. 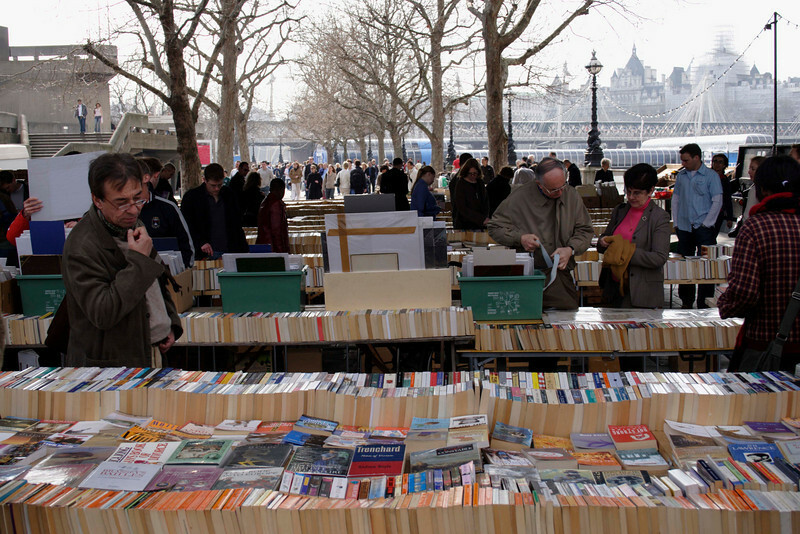 Under Waterloo bridge are literally tables of second hand books. I have no idea if they’re there all the time or on certain days – but if you’re looking to nab a second hand book and passing through, then I can assure you there are a bunch and then some available there. I will discuss the thing that the library has to offer in another post about touring London, but today, we’re going to focus on the gift shop. 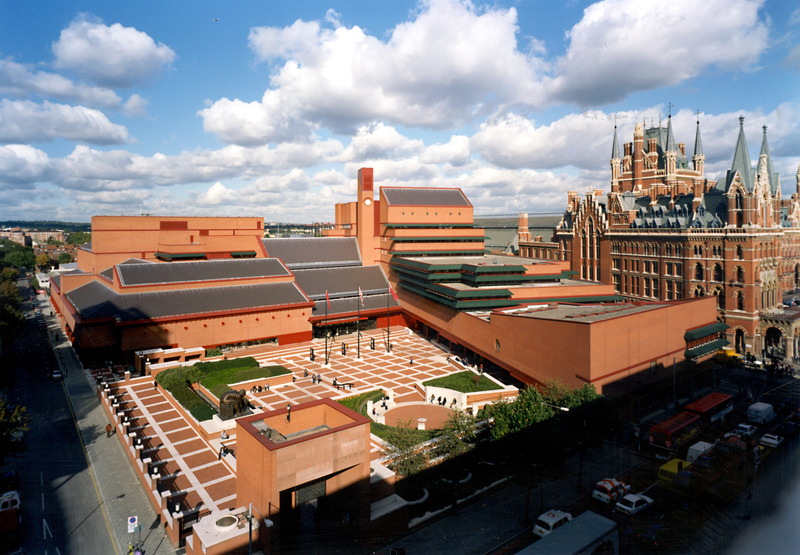 OBVIOUSLY, the gift shop for The British Library is going to offer you a rather sophisticated collection of books to buy. I highly recommend taking a wander through. It’s not huge, but it does have some unique and cool things. All the classics are certainly on offer there (in fact, I did find Phantom here but by this point had decided not to buy it in England, #Typical). The greatest thing in the library’s shop, though, is not the books. It’s their exclusive merchandise. So if you’re looking for that particularly bookish mug or bookmark or something else that’s crazy, then definitely swing by here. I picked up the most fantastic mug (very reasonably priced) that was white and said “Dr Jekyll” on it, but when you lifted it up to drink, “Mr Hyde” was written in black on the bottom of the mug. I laugh every time I drink from it. Now, this isn’t a bookstore per se, but I wanted to share it with you. I stayed near enough to Hatfield House so I popped in one day to have a look around and found a little hidden gem. As you make your way towards the merchandise stores, you’ll find one that’s selling all sorts of knick knacks. There are toys, crockery, postcards, crocheting, you name it. But if you head to the very back of the store (to the left) there are some books for sale. They have British historical fiction galore. But most importantly, they have some editions of various classics that are gold dust. This is where I picked up a copy of Sense & Sensibility that you cannot buy anywhere else on the Internet (I’ve yet to check with the universe). Whether they’re always there, I don’t know, but if you’re heading that way then it might just be worth a look. Hatfield House is a stately home that was first built in 1611. It is Jacobean architecture and pretty fantastic to look at. There is a tree there called The Queen Elizabeth Oak and it is said that this was the location that where Elizabeth (I) was told she was now queen after Queen Mary died. You may be curious as to why this is on the list, but here’s to obscure list items! 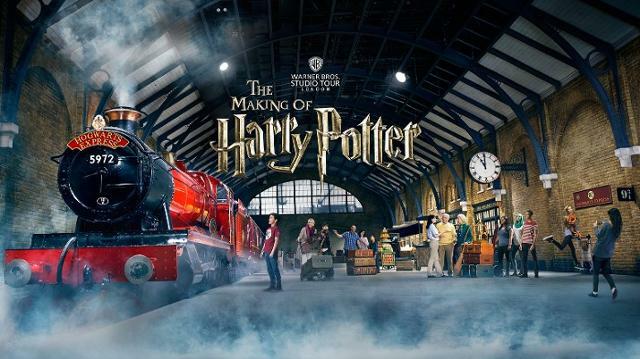 The studio tour, apart from being the most magnificent thing in the universe (and I will be doing a discussion post on it) offers something particularly unique for ye book dragons. After spending 3047 hours walking through everything the place has to offer, you are presented with the largest merchandise store you have ever seen. Being HP, the one very important thing that you can find in this store is the Harry Potter books. – but most importantly, they’re specially marked on the cover to let the world know where you got them from. I didn’t buy one of these myself despite really wanting too (#LuggageStruggles) but they look gorgeous. You’ll find a not-so-little golden stamp on the front cover that proudly states that this is not only HP but a HP from the studio tour. Thereby announcing you as a Proud Potterhead and Avid Book Collector. Goldsboro books is a specialist store for signed first editions of books that sell for crazy prices. They had a first, signed edition of The Philosopher’s Stone – let’s just say it was up in the thousands. This was cool to see how expensive the books were but mostly I just sort of walked in and then walked out again. I literally got put off going into this one because it had some seriousness funky (and not in the good way) books on display in its windows. I decided I’d much rather high-tail it down to Foyles. This store appears on almost every list of bookstores you should visit in London. Unfortunately, I just didn’t have the time to squeeze it in! Again, this is a bookstore that appears on almost every list and always right at the top. It’s such a shame I didn’t go by that area but one day I’ll hopefully be able to return and visit it! If I’m being entirely honest, I just really liked the name of this one. I had every intention of checking it out but I just ended up not going near it so I missed out. This is Google’s deception of it, by the way: “Publisher/bookseller of out-of-print female writers with timeless covers and period endpapers.”. Yep. Well, all things considered I did well to check out the stores I did see. But I completely forgot about this store whilst I was in England! Stanfords is a pretty famous British bookstore but I must’ve just not passed one so it never occurred to me to seek one out. 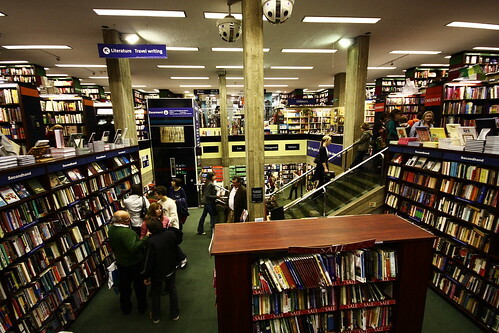 What’s your favourite bookstore abroad? They are GORGEOUS. And that is a perfectly valid reason to go! It’s such a great city though and you can never run out of things to do! Aw that’s such a shame that it’s closed! And I’ve heard of that book 🎉 it’s definitely one I think I might stick my nose into at some point. 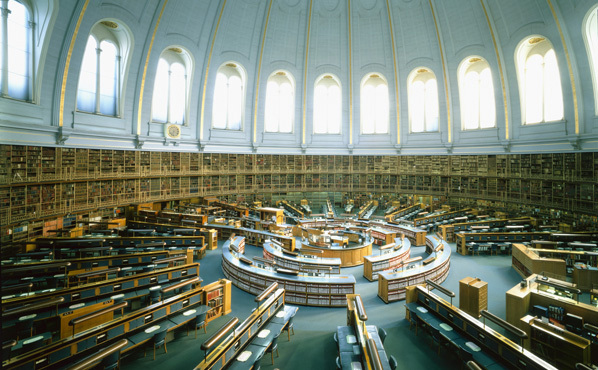 The picture you have of a domed reading room is of the ‘old’ British Library…it’s now part of the British Museum. And a fun fact: Daunt’s is owned by the same dude who runs Waterstones. Ooh I’ll have to check them out. And that’s so cool! Wouldn’t it be wonderful to be able to claim both those stores as your own? I LOVED The British Library gift shop. I bought one book there, some library card socks, and some fudge. Then I did some online shopping when I got home to get a special exhibition book that was too big for me to squish in my suitcase (the Magna Carta exhibition was on when I went so I had to have a book about that), another paperback, and some more fudge. If/when you go back to London, you need to go to Hatchards – they are the official royal booksellers. They have a shop in Piccadilly and one in St Pancras station, which is the one I went to. I think it has a smaller selection than the Piccadilly shop, but they do same day interstore transfers which was super convenient (I made good use of the service!). But my absolute favourite overseas bookstore is Shakespeare and Company in Paris. I visited the shop twice when I was in Paris last year. I swear just about every book ever is in there, but it’s really tiny and busy so I found I couldn’t really take my time browsing too much because people. But it’s still delightful. Yes omg it was so hard not to buy absolutely everything!! There were so many beautiful things for sale! My friend recently went to Shakespeare & Co! She said it was magnificent – I hope I can get there one day! You definitely should – and make sure you get your books stamped when you buy something; that was the most fun thing for me. Ooh that’s cool that they stamp them! Hi! 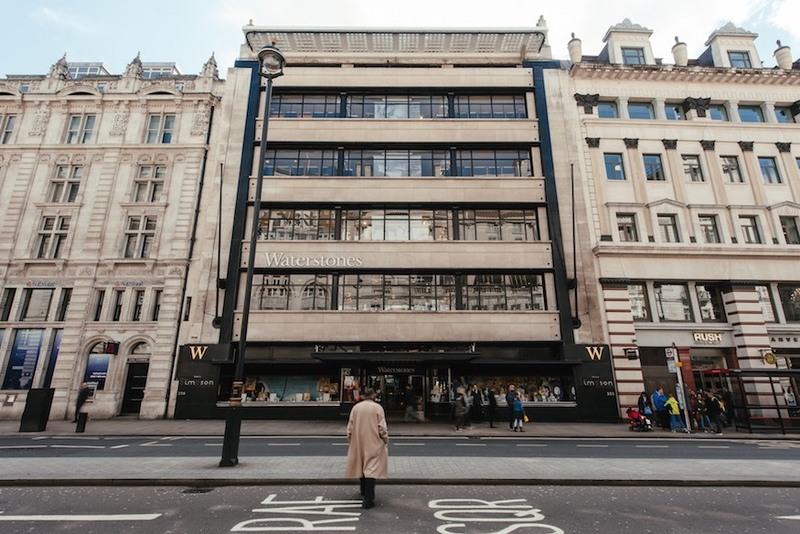 I’m currently living in London as a student and there are SO MANY good bookstores here! I would totally recommend Charring Cross area that is filled with a lot of secondhand and antiquarian bookshops (my favourite is Any Amount of Books). South Kensington Books (right beside South Kensington Station) is also a gem! London Review Bookshop is also amazing because it sells a lot of non-mainstream titles that gets you discussing them in depth! Word on Water is a bookshop on a boat near King’s Cross Station and that too is a very unique experience. OMG! I want to cry!! These stores are SO beautiful! !